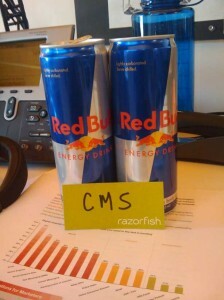 Web 2.0 & Enterprise 2.0 & CMS Dilemma..Where’s the total solution? A common conflict I am seeing across companies is the clash between the CMS needs of B2C or external web 2.0, social media, Internet infrastructures and internal B2B/B2E Enterprise 2.0 Enterprise content management efforts. While I do see a convergence within the Enterprise 2.0 and CMS markets, I still do not see a enterprise cohesive solution for Web 2.0 and CMS that bridges the gap between internal and external efforts. I see many companies are still looking for the holy grail of solutions that will fulfil all their needs (B2B, B2E, B2C) but the fact is (and I am sure many people will disagree), solutions such as Microsoft Share point and other ECM tools that excel within the intra-nets, often fail to meet expectations within in the B2C Internet scenarios. However, this holy grail will needed when it comes to holistic compliance and legislation requirements in the future. Internal efforts within companies can live with canned, generic solutions, while B2C Web 2.0 solutions needs to be unique, cohesive, and sticky. Now I know that the evangelists of Microsoft, Documentum, Drupal, and Joomla will all say that these solutions can meet that need. But the problem I see within the market is speed. Almost of the time these solutions needs at least three to six months to get a site online that meets all the needs of creative, user experience, legal, compliance, analytics, and most importantly the business. I wish a solution was developed using the API first methodology where a CMS was not bound at all by platform, the entire engine is web service, REST, JSON driven. This will allow the entire infrastructure to be totally segmented from presentation and be placed in the cloud not be tired to .Net, Java, PHP, Ruby, etc. I know this is a rant…but where is it? Previous PostInformation Technology vs. Business Needs in CMSNext PostSuccess is Content Distribution, but be careful. JSR-170 might be too limiting – since it only speaks to interoperability within Java apps. We need another level of abstraction, I think. CMS in the cloud like “DAY” is a totally viable solution in time sensitive situations and marketing teams. What about products like Day, that have really focused on building JSR-170 compliant solutions? Yes, very interesting. Perhaps we should look at CMS solutions as individual knowledge repositories (ie. pushing content, more process, more logical). You will have your J2EE and .NET experts. Then, look at cloud computing as the “glue” that brings it all together (ie. pulling content, more creative, user-centric). You will have your client-side JQuery experts.